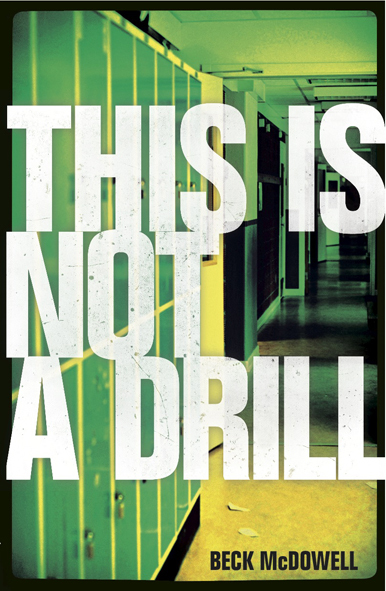 This is not a Drill is an engaging book written in first person from the alternating perspectives of Emery and Jake. Emery has volunteered as a tutor for grade-one. She loves the kids and teaching language. She is essentially a shy girl who loves people, she is inspired by the classroom teacher and wants to be a teacher. Jake is Emery’s ex. He is a likeable, charming boy who wants to sleep in two mornings a week so volunteered to tutor French. The two of them didn’t expect to be put together but sometimes these things cant be controlled. We meet them trying to make the best of the situation. Jake wants to befriend Emery again, he still likes her but knows that he did wrong by her. He is using this class as an opportunity to show he isn’t all that bad and maybe the two of them still have a chance. Emery is happy to be friends but wants time to get over Jake. The trickiness of being together is outweighed when an unstable war veteran father shows up in class demanding to take his son away. The teacher stands firm and protective of all her students and refuses permission even when the father pulls out a gun. The pace and action of this story change consistently. We learn about Emery and Jake through flashbacks and memories of childhood, their relationship, summer holiday events etc. We follow the two of them as the situation escalates and people are shot. Also as they learn to trust and work together despite their past. It is up to Emery and Jake to find their strengths and work past their fears to save the kids. The student’s father is a soldier home from Iraq who is no longer fit for duty. As time passes his character is fleshed out and is very interesting. We learn a lot about his difficulties and our sympathies develop for him and his family situation. In all this is an exciting book that takes us into territory that is not usually covered.